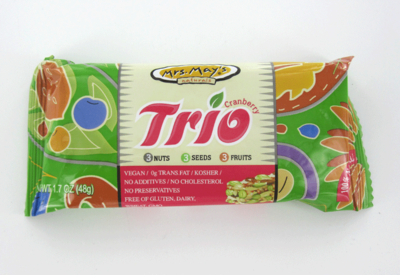 I recently came across one of these Mrs. May Trio Bars. Looks natural and healthy. I flipped over the package to check out the ingredients to see how natural these are and noticed that the bar was made in China. These days I know we’re all used to having every toaster and computer made in China, but are we ready to have our food products made there? sale. The last 40% of the ingredients are sourced from Vietnam. Mrs. May moved production from Orange County, California to China 5 years ago according to this article. The minimum wage in California is $8/hour. A person’s yearly salary at that rate, working 40 hours a week and 52 weeks a year $16,640 or $1387 per month. If Mrs. May is hiring 50 people for that amount, each employee is making $27.74 a month. If you give weekends off, which is a questionable premise since it is common for factories in China to give employees only a couple of days off month, employees are making making $1.27 a day or $.16/hour assuming 8 hour days. This may be the prevalent wage, but is it a fair one? Can you blame Mrs. May for moving production to China when labor costs are this low? This is raw capitalism. When people say that the government should stay out of businesses way, this is what we get. Companies maximizing profit without accepting societal or environmental consequences. I love Trio bars, but today I broke my tooth while eating one. After reading this post I wonder if sending their product to China has something to do with it. There was definitely something in there that shouldn’t have been there. COSTCO discontinued the sale of this product in May 2011…according to Sue at customer services. Sue at Costco needs to check the store in Kalispell MT. They have them; however, AZ stores do not. I will probably buy them from Amazon unless I find a protein bar that does not contain chocolate(messy) or peanut(allergic). I am wondering if they switched to China to make the bars more affordable for consumers or to garner more profits for themselves. China cuts corners because they are making so little to begin with. The “going rate” is most definitley not a fair rate. Have you seen how the people working for what they are paying have to live? I say no thank you. I recently tried these bars and loved them! However, I won’t be buying them since they are not made in the USA! What’s the reason for this? People want quality products, not made of the backs of cheap labor and food and drug departments that allow unsafe things to pass to us in the USA. COSTCO may have discontinued the sale of Trio bars in May of 2011, but have since started selling them again. I just bought a box at the Salem, OR, store on 27 July 2012. Very tastey, until I realized the product was from China. Will I buy Trio bars again? No. Too many reports of less than hygenic production lines, and too many reports of lacking (even absent) quality control. As a CELIAC this is a hard choice because of the limited number of tastey treats available to me. Sorry Mrs. May – I thought I’d found winner. Looks more like I found another corporation that values profit for a few over quality for the many. I also stopped buying Mrs. May’s products when I saw they were manufactured in China. I would not even feed my dog any products made in Chine, never mind myself. I want my food made in my own country, USA. I bought a package at Costco in Richmond, CA just before leaving home nine days ago, ate them all, tried to get more at Costco stores in the Memphis, TN area, which had them when I was here two years ago and again in December. However, they no longer carry them. Now that I know they are produced in China, I will stop looking for them. I feel that is so irresponsible of the Mrs. May Company, even though I love them and thought they were very healthful, as well as delicious. to line our own pockets! As far as I’m concerned, that goes as well for stores such as Walmart, Gap, Apple, etc., etc.! I like the bars and don’t care if they are made in China. The reality is you are putting food on somebody else’s table. You think not buying these bars is going to change China, you got to be kidding me. I agree, although you may think of it as slavery, that is how they make their living. I just bought these from Costco, and after I got home I noticed they are a product of China. I am returning them tomorrow. I have eaten these bars for several years–purchasing them at Costco. 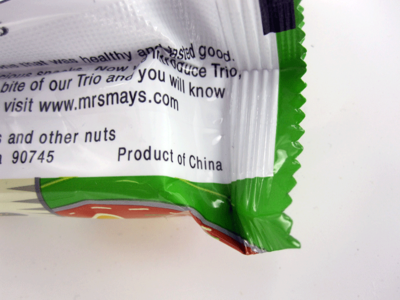 I’m not sure how I missed the “product of China” label all this time; but I discovered it about 2 months ago. I have since written to the Mrs Mays company to let them know I would no longer be purchasing their bars because of it. I am so very sorry but I cannot buy these bars anymore. They were a staple food for me but for health and safety reasons I will no longer be buying these bars either. It’s such a shame that this situation even has to exist. I was searching for a place to buy these family favorites that Costco in Denver has not carried for awhile. Sorry to say I will not be buying these from any of the marketers that popped up. China? Really? Oh no. Hope they will bring production back to the USA. I really like them,and they make a satisfying meal substitute when busy….just don’t trust Chinese food processing.